Just 24 hours after opening up pre-orders for the new iPhone 4S, Apple has rolled back expected shipping times for the device from expected delivery on the Oct. 14 launch date to an estimate of 1-2 weeks. 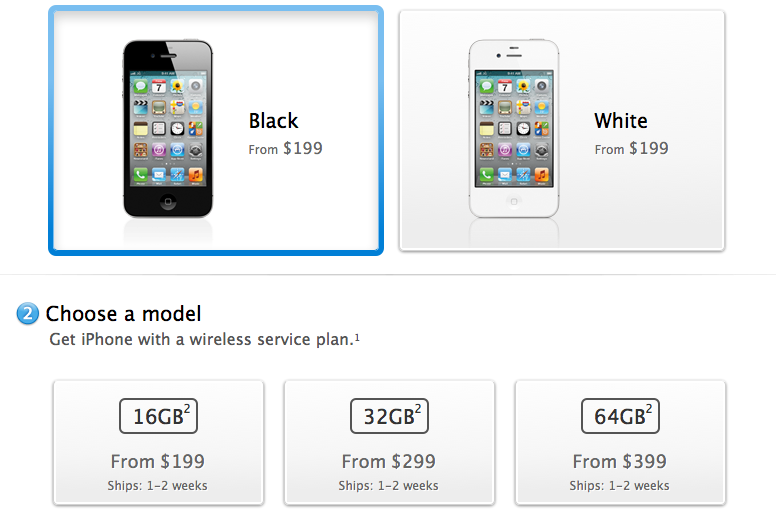 The Apple Online Store changed its pre-order availability for all models of the iPhone 4S early Saturday. Apple had promised to begin taking advance orders for the device at 12:01 Pacific on Friday, but slight hiccups delayed sales for Apple and AT&T. The company's other two wireless partners in the U.S., Verizon and Sprint, were able to begin pre-orders on time, though some customers reported having trouble completing orders from Apple and carriers alike. AT&T announced later on Friday that it had received more than 200,000 pre-orders for the smartphone in just 12 hours, a record for the company. Unveiled on Tuesday, the iPhone 4S features the same external design as the iPhone 4, but adds Siri voice control, a faster A5 processor, an 8-megapixel camera and a new antenna design. Though some have expressed disappointment that the handset did not receive a form factor refresh, Wall Street analysts remain confident that sales of the iPhone 4S will easily top previous records set by the iPhone 4. Sprint noted on its website late Friday that it had completely sold out of pre-orders for the 16GB iPhone 4S, though, as of early Saturday, the 32GB and 64GB versions were still available for advance purchase. The carrier does, however, state that the 16GB model will be "available in stores on Oct. 14." Verizon may also have sold out of its initial pre-order allowance of 16GB models. 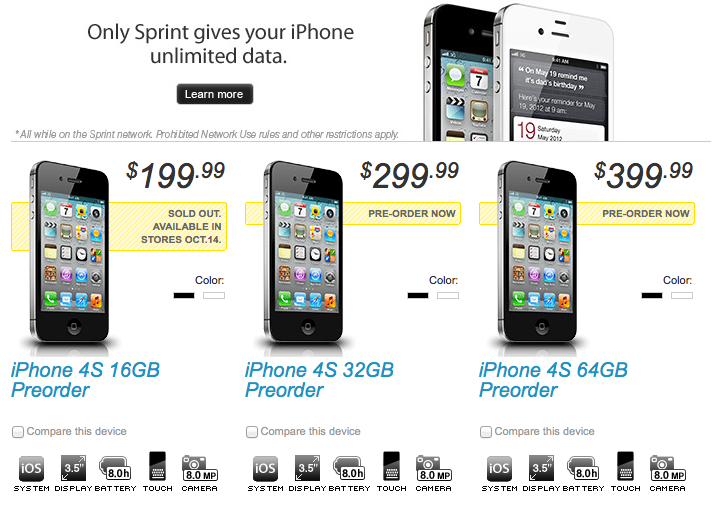 The carrier's website currently lists 16GB models of the iPhone 4S for Oct. 21 delivery. Also, some AppleInsider readers report that orders placed on the Verizon website at 12:01 a.m. on Friday are now estimating delivery on Oct. 21. Though not a publicly disclosed practice, recent history and evidence supports the fact that Apple allots restricted amounts of devices for its partners to offer on pre-order and at launch. According to a recent report from The Wall Street Journal, Sprint has basically "bet the company" on the iPhone and has agreed to purchase 30.5 million iPhones over the next four years. This is the first iPhone launch in the U.S. where Apple has to manage multiple carrier relationships. The issue is also exacerbated by the fact that the iPhone 4S is a "global model" and the same model can work on both CDMA and GSM networks. For those willing to wait, Apple will release a GSM-unlocked version of the iPhone 4S in November, with 16GB, 326GB and 64GB models selling for $649, $749 and $849, respectively. The company cautions, however, that the unlocked iPhone will not work with CDMA carriers such as Verizon and Sprint. Apple has had trouble producing enough iPhone and iPad models to match pre-order and launch day demand in recent years. Even the Verizon iPhone 4, which launched 8 months after the GSM iPhone 4 arrived, sold out of pre-orders on the first day on offer.